This intense yet peaceful ballad works great as a trio, a quartet or with two horns trading phrases. 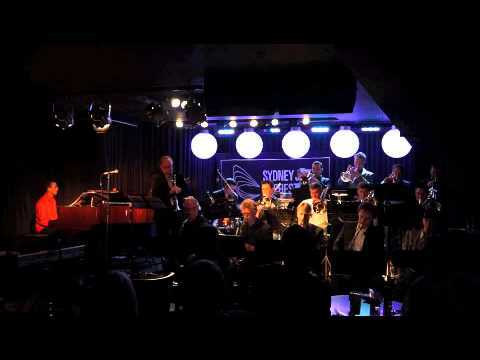 Sydney Jazz Orchestra featuring Simon Sweeney, trumpet; live at Blue Beat, 2012. Don Sickler: "The seemingly nostalgic flavor of the opening of the melody constantly evolves and develops in this beautiful 32-measure composition. It's constructed in four-measure phrases; the second phrase starts by echoing the first. After a contrasting second eight-measure section, the first four-measure phrase of the melody re-enters, up a major third, then immediately moves back to its original position before climbing to start a development of the second contrasting theme. The last four measures of the ending section of the melody returns to the opening four-measure phrase. "Before performing this powerful melody, you might find it interesting to examine two of Kenny's treatments. In the original recording featured here, with Pepper Adams, Kenny states the first eight measures of the melody, then Pepper has the second eight measures. Both players (in octaves) play the third eight measures, crescendoing into the fourth eight-measure phrase which decrescendos into the repeat of the opening four-measure phrase that ends the melody. Click on the 'One Of Many' album cover above for details about that performance." Don continues: "Pepper Adams' week-long engagement in August, 1983, playing at Fat Tuesday's jazz club in NYC, was an easy walk from my loft in Manhattan. It was my first chance to see, hear and talk to Kenny Wheeler in person. He completely blew me away. Kenny had come to the US in May, 1983, to record his fourth album as a leader for ECM, 'Double, Double You.' Then he went back to the UK to record in July before coming to perform and record this live album with Pepper Adams. Pepper had been raving to me about Kenny, and he was right." Don continues: "On Kenny's 2006 trio recording, 'One of Many,' the pianist states the first eight measures, with Kenny joining for the second eight. Piano again states the next eight, with Kenny coming back for the last eight measures of the melody. Electric bass then solos first. On the Pepper Adams recording, Kenny solos first. Listening to him solo, you immediately hear that he is a wonderful and unique soloist as well as great composer. I had carefully gone over the lead sheet melody with Kenny years ago and now notice that he had suggested an octave higher note for the last note. I've indicated the lower octave in parenthesis, since he records it that way."